As well as baking biscuits for friends and family, this year I was involved in a cookie swap. Andrea over at Made with Pink was the instigator of this exciting venture. Basically, a group of food bloggers were allocated a member of the group to bake for and would receive in return cookies from another member. All was to be kept secret until the cookies turned up and the baker was then revealed. I’ve never taken part in anything quite like this before and I really enjoyed both the execution and the anticipation. The “lucky” recipient of my Christmas butter biscuits turned out to be Kevin over at The Crafty Larder. When I saw these Christmas Tree Cookies over at Kelly Cooks, I knew they were going to the ones I would base my cookie swap on. It’s such a clever but simple idea. They look particularly festive and they have the added bonus of being great fun to make. My Christmas butter biscuits were going to be a bit different, of course. As regular readers will know, I’m not overly keen on using artificial colours and prefer to use natural ones that also have a flavour. I wanted something green for the christmas trees, but couldn’t leave out my favourite chocolate either. We Should Cocoa is all about Christmas this month so I had this very much in mind when planning my biscuits. However, green and brown together seemed a little drab – what a dilemma. In the end, I decided to go all out and make three different doughs: vanilla, chocolate and matcha. The process of making these cookies is surprisingly simple. It’s just a question of rolling out each dough, cutting circles, then stamping out a star (or whatever designs you fancy), then swapping the stamped out shapes over. Every cookie gets an outer flavour with a different flavour in the middle with contrasting colours. Genius. The anticipation of receiving my biscuits grew as the days went by. What would they be? Who would they be from. At last I received a beautifully and carefully wrapped parcel in the post – not a biscuit was broken. Eagerly opened, I found two parcels of biscuits inside along with a Christmas card from Andrea. It just gets better and better. I had a stack of festively stamped sugar biscuits and quite a few large mint chocolate chip & M&M oat cookies. Both were delicious, mint in biscuit form is fairly unusual, so I dived into one of those first. The mint was really refreshing and the cookies delicious. In fact both sets of biscuits were very moreish and not having made them myself, they were particularly enjoyable. Many thanks to Andrea both for organising the cookie swap and for my scrumptious biscuits. Three differently coloured and flavoured biscuit doughs are used here to great effect. Simple to make, these vanilla, matcha and chocolate biscuits are also very easy to eat. Beat in the eggs, one by one along with the vanilla extract if using. Work in the flour until it all comes together. Divide the mixture into three. Add the cocoa powder to one batch and the matcha to another and work that into the dough. Cover each one and leave to chill in a cool place for half an hour or so. Roll the doughs out to about the thickness of a £1 coin and cut out circles that are big enough to allow for your chosen shape to be taken from the middle. I used a 7 cm diameter cutter for the stars and a 8 cm diameter cutter for the Christmas trees. Place the biscuits on lined baking sheets, then cut our stars, Christmas trees or whatever else you fancy from the middle of the biscuits. 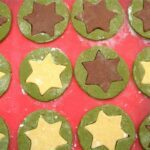 Transfer the vanilla cut outs into the equivalent shaped holes in the matcha and chocolate biscuits and do the same with the others so each biscuit has a different coloured and flavoured centre. Bake at 180C for about 12 minutes or until the biscuits are just starting to change colour. Rebecca over at Munchies and Munchkins is hosting #WeShouldCocoa this month and very aptly chose Christmas as the theme. These Christmas Butter Biscuits are my entry. These matcha, chocolate and vanilla cookies also go to Dom over at Belleau Kitchen for Simple Eggcellent. Thanks for visiting Tin and Thyme. If you make these eye-catching Christmas butter biscuits, I’d love to hear about it in the comments below or via social media. Do share photos on social media too and use the hashtag #tinandthyme, so I can spot them. For more delicious and nutritious recipes, follow me on Twitter, Facebook, Instagram or Pinterest. Christmas Butter Biscuits. PIN IT. I haven’t tried match anything yet, but I’m in love with the colors! Thank you Lydia. Matcha is fabulous in baking, I’m a big fan. These are lovely. Such a simple idea, but very effective too. Thanks Diana, they taste pretty good too. The mix of flavours was just right. These are SO pretty Choclette, what a lovely idea. Must give these a try with ‘help’ from toddler…. he would love them! I love baking and theese cookies look great but where do i get Matcha from and is it a flavour or a colour?. Hello Mary. Matcha is a Japanese green tea powder. it’s not cheap, but a little goes a long way and it’s very good for you. I really like it as a flavour in baking, but also love it for the colour. You should be able to get matcha at any good health food shop and it’s easily available online. For baking you don’t need the superfine highest quality matcha, so look for the cheaper versions. Dear Choclette – our postie has just delivered a surprise box of these from you. We can hardly say thank you – only because it’s rude to talk with your mouth full. Your biscuits really are buttery, beautiful, moreishly delish. Wow that green matcha stuff is amazing and they look great too. Yum yum yum – and – thank you – very much. They’re great fun – I love those colours. Perfect for the season and definitely preferable to yet another mince pie in my opinion. Thanks Phil. I value your opinion highly, but you know what? I haven’t had a single mince pie yet this year. Something is very wrong. gorgeous biscuits – just the thing for Christmas – some beetroot powder might be good here to bring in some red – though it always turns out a little pink. And the cookie swap sounds like fun. Thanks Johanna. Beetroot powder is good for colour, but doesn’t do much for flavour and it’s fun to have different flavoured doughs in the biscuits. Guess you could use orange or something with it. Thanks Andrea. It’s a fab idea, though I can’t claim the credit. It was fun taking part in the cookie swap and thank you again for the gorgeous biscuits you sent. Merry Christmas to you too. I really love these cookies and am dying to try out matcha in baking – yet to find a good but not too expensive source. the two-tone effect is great. Thanks Lucy. Matcha is rather expensive, but a little goes a long way. You can get baking grade matcha, which is a lot cheaper. Try VitaLife. Fantastically festive and perfectly clever Choclette. I love that you have used natural flavours. That matcha green is perfect for Christmas!